The Commando beret is a specially designed beret with small crown for a consistently neat appearance when shaped to the head. Small crown reduces overhang on right edge. Easy to shape, 100% wool beret. Top lining only which bulk when shaped and worn. Hem is synthetic leather bound with drawcord tie. The badge mounting strip is reinforced with a vinyl strip. True to colour and anti-bobble when cared for correctly. Manufactured in Germany using EU materials. 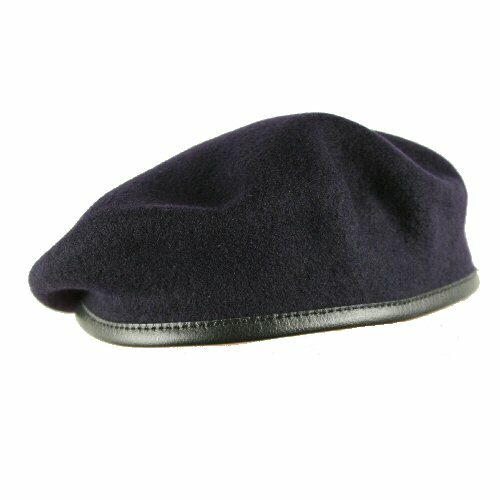 Beret colour is navy. This colour beret is slightly larger to sit squarely on the circumference of the head; if it is intended to be worn higher, a smaller size should be chosen. Available options are: 55 , 56 , 57 , 58 , 59 , 60 , 61 .